Hollywood actress Meryl Streep said she is scared of President Trump. Streep made comments about President Trump during an interview on “The Late Night Show with Stephen Colbert,” at the annual Montclair Film Festival fundraiser. And Streep delivered a sobering assessment of Trump. 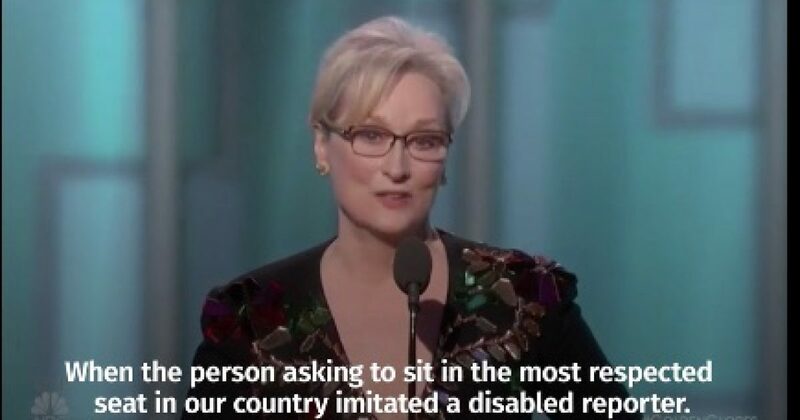 This is not the first time Streep criticized President Trump. At the 2017 Golden Globe Awards, Streep made critical remarks about President Trump during her Cecil B. DeMille acceptance speech. Watch the Hollywood Foreign Press Association video clip. The Hollywood and entertainment elite despise President Trump and will take every opportunity to slam him.